Tyrannosaurus Rex, a bipod, walked on its large rear legs with its massive head stretched forward, using its long tail as a counterbalance. No one is sure about what color T-Rex was, but experts do know that it had scaly armor-like skin, similar to that of an alligator. T-Rex had a massive head, measuring 5 feet. Its 4 foot jaws and 6-10 inch teeth made it a powerful biter and a fearsome sight. T-Rex had two small eyes, but experts disagree about its sight capabilities. They do agree that T-Rex had extremely large olfactory lobes and used these to smell food several miles away. 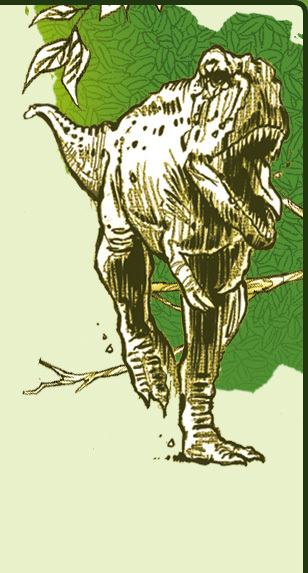 So regardless of sight capabilities, T-Rex could locate food from scent alone, if necessary. Tyrannosaurus Rex was a carnivore (meat-eater) who dined on other dinosaurs. It is possible that T-Rex was both a scavenger and predator. Tyrannosaurus Rex lived in the forests and plains of the Northwestern United States (Montana, Texas, Utah, Wyoming and New Mexico), Canada (Alberta and Saskatchewan), and East Asia (Mongolia). About 30 incomplete fossils have been found throughout the US, Canada and East Asia. One fossilized footprint was discovered in New Mexico and fossilized dung containing small pieces of a Triceratop’s bones have also been found. Tyrannosaurus Rex was at the top of the food chain during its time. Although it is not evident if T-Rex preyed upon its own species, many fossils show that it was definitely aggressive towards its own kind. T-Rex fossils have been discovered with healed T-Rex bite marks in them.